Here is a list of best websites to learn Greek online. You can confidently access any of these websites to learn Greek language, if you are confused about how to learn Greek online. These selected websites will make learning Greek an easy task for you. Not to mention, these websites to learn Greek online are absolutely free. Some of these websites also teach you Ancient Greek. 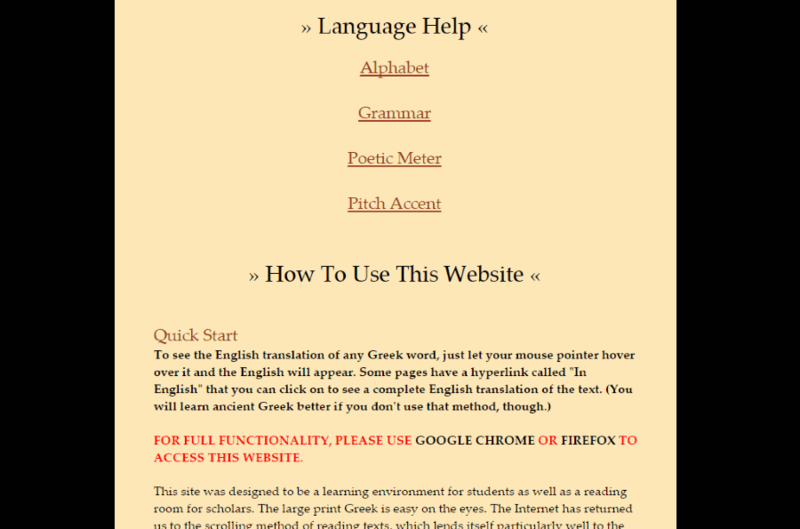 There are very few websites to learn Ancient Greek online, but they are effective. Greek is the native language to Greece. Greek holds a very strong place in history of the World. Spoken by more than 13 Million people, this language is widely used in Greece, Cyprus, Italy, and Albania. You can also checkout the list of best free websites to Learn Spanish, Learn Portuguese, and Learn French. 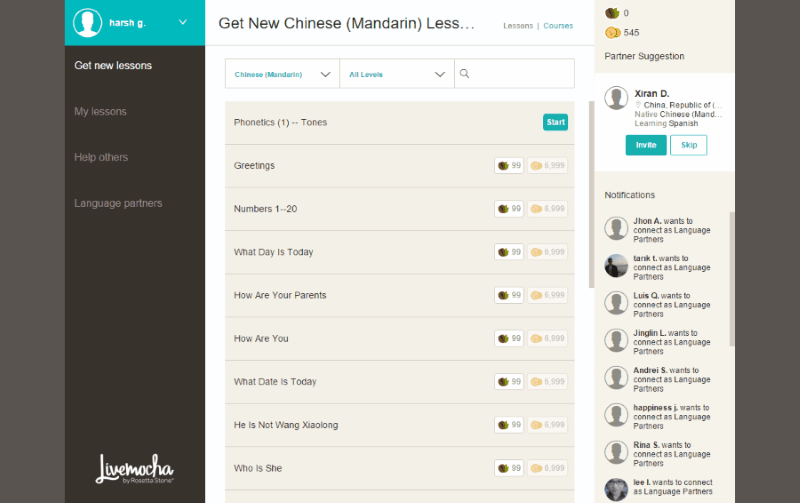 You can learn Greek online on this another good website, LiveMocha. The Greek language course is divided into 9 levels. Begin to learn Dutch language from Level 1. The first level consists of Greek alphabets, numbers, vocabulary, basic phrases, etc. These lessons are made up of video tutorials, and examples. Move on to advanced levels after learning the basics. The advanced levels will teach you advanced Greek grammar, phrases, sentence formation, and much more. Learn the basics of Greek at Learnalanguage. The course to learn Greek begins with a short introduction of Greek language, followed by a list of Greek words. 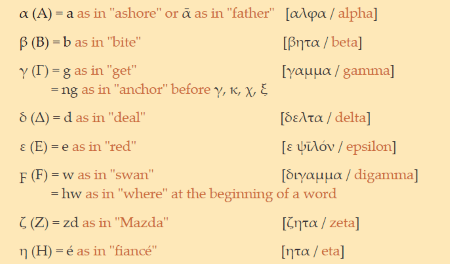 It is a vast list of general Greek words with Greek translation, and pronunciation. Learn common and useful Greek phrases along with Greek Verbs. At the end of this short Greek language course, you will also get to read and learn about Greek Culture. 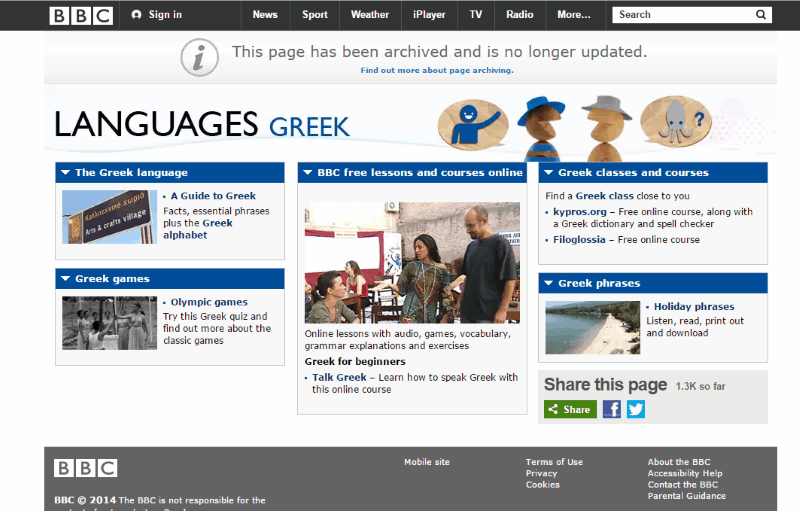 BBC Language provides a professional language learning course for Greek language. 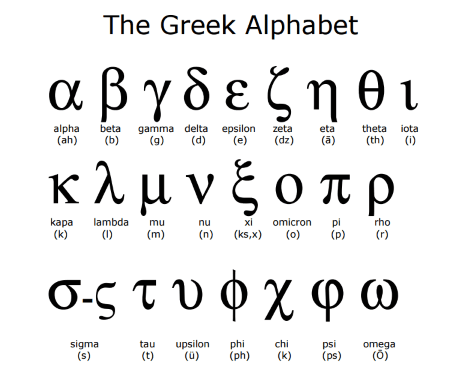 Begin the course with an introduction to Greek, and then learn the Greek alphabets. Go to the Talk Greek section to start with the primary course. You will find 9 different modules in this section. These modules are divided on the basis of various everyday situations. Learn important phrases and their pronunciation. 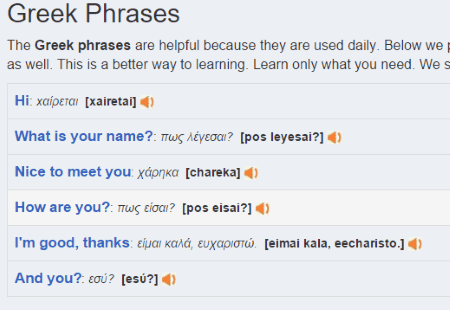 Learn Greek online at Loecsen with the help of conversational phrases. The phrases are categorized into various modules based on different situations where they could be used. Go through each module to learn Dutch translation of each phrase. Click the play button to hear the translation in Greek. The renderings help you understand the situations better. Download the MP# and PDF version of course to learn Greek anywhere. 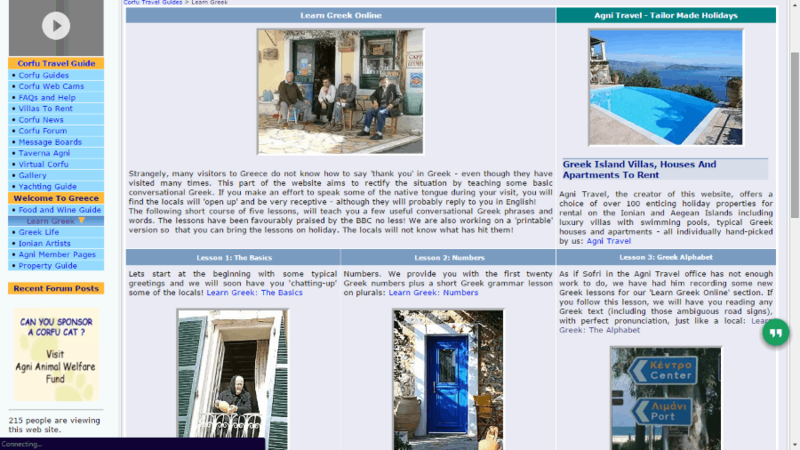 DigitalDialects is another good website to learn Greek online. 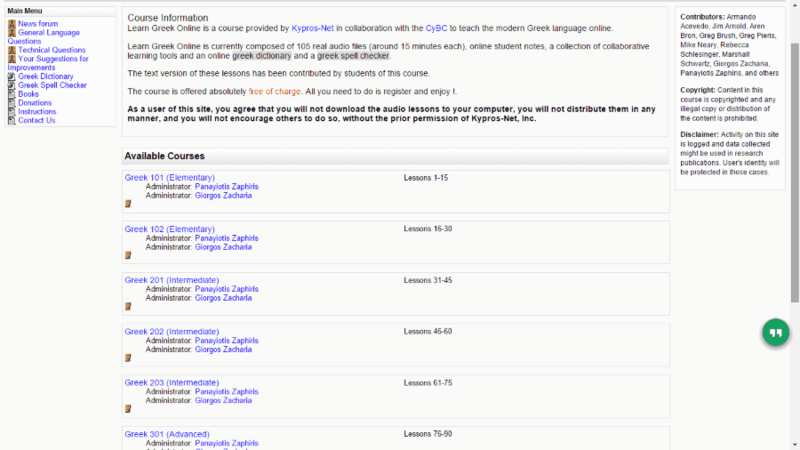 This Greek language course has 7 modules. These modules include Greek vocabulary builder, colors, fruits and vegetables, animals, etc. 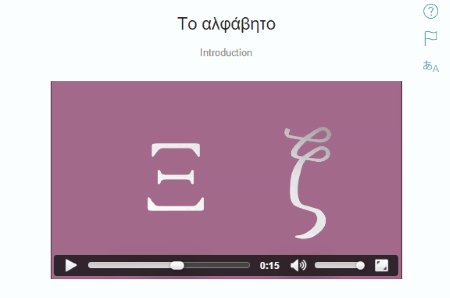 Supported by audio playback, you get to learn the pronunciation of the Greek words. 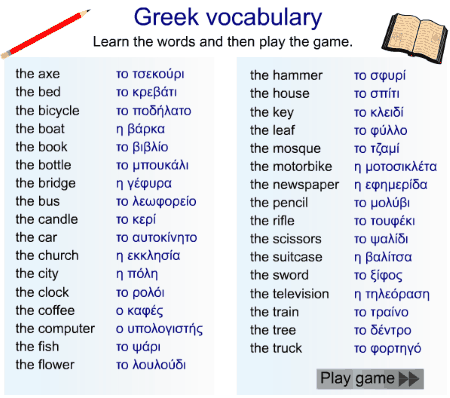 Greek language learning games are added advantage to this website. 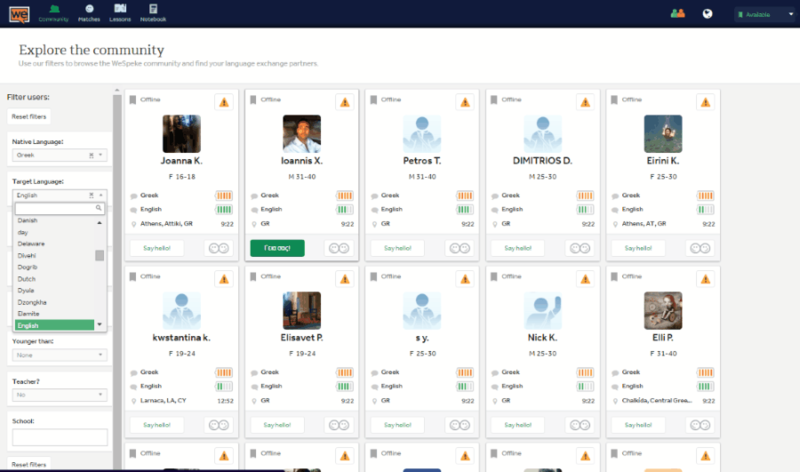 iLanguages is a multi language learning platform to learn Greek language. This is learn at your own pace course, which will teach you Greek words and phrases. General words and phrases are translated into Greek language with audio playback. Language learning tools, like Flashcard and Quiz are available as well. Match random words with their Greek translation in the Quiz section. Take Greek grammar lessons to learn more. Learn Greek for free at Goethe Verlag with the help of 100 free lessons in Greek language. The first few lessons will teach you the basics of Greek. These include Greek alphabets vocabulary, phrases, sentence formation, pronunciation, grammar, numbers, etc. The advanced lessons will teach you complex grammar and other complex phrases. 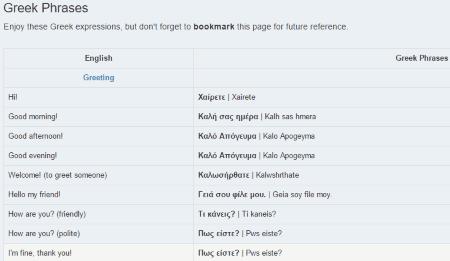 Click on the play button to listen to the Greek translation of words and phrases. 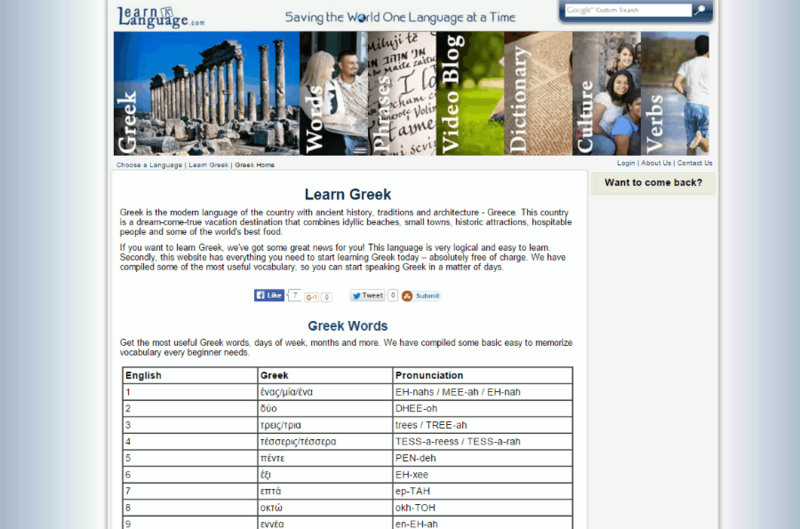 WeSpeke offers a free interactive platform to learn Greek online. 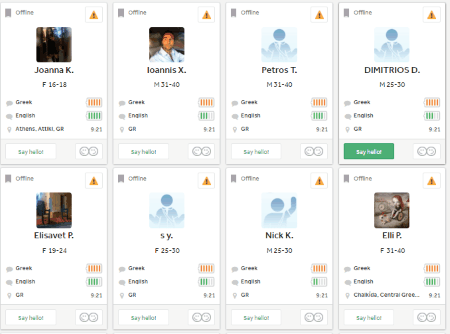 You can chat with the members of website who know Greek, and learn Greek language from them. Simply set language preference, like your native language, and the language you want to learn. Choose an online member to begin a chat with them. The website lets you add the members as friends on your profile. This is one of the most innovative and interactive way to learn Greek. Kypros is a dedicated website to learn Greek language. 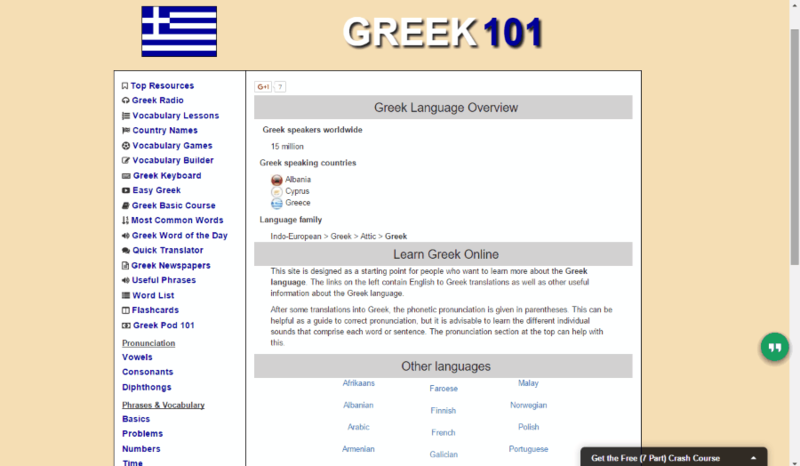 This website has more than 100 descriptive lessons to teach you Greek online. There are 8 modules available here. These modules are comprised of elementary, intermediate, advanced and ancient Greek lessons. Each module has Audio lessons, notes, personal journal, discussion forum, and questionnaire sections. You can login to save your progress, or even study Greek as guest. LearnGreekFree.com has video and audio supported materials to learn Greek language. 13 different lessons are available on this website which will take you through the essentials to learn Greek, step by step. Watch the video tutorial, and learn Greek language for free. Xanthi is another dedicated website to help you learn Greek free. Go through 15 different chapters which include Dialogue, Vocabulary, Grammar, and Useful Phrases section. 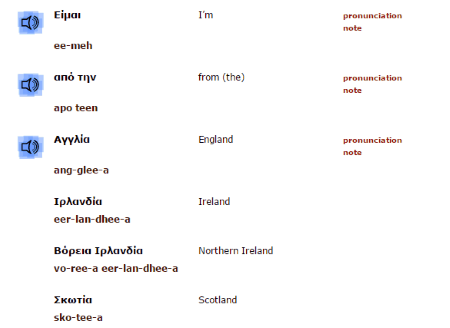 Listen to the audio to learn proper Greek pronunciation. The chapters teach you Introduction, Greetings, Holidays, conversations, etc. e-Learning Greek provides you extensive resource to learn Greek online. You can go through 3 different modules to learn Greek. 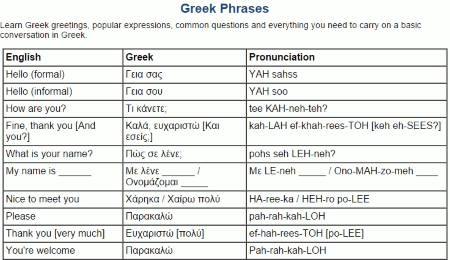 Language: Go through the list of general Greek vocabulary, phrases, pronunciation, syntax, etc. Grammar: Learn deeply about the Greek grammar which includes, Articles, Verb, Adverb, Adjective, and Pronoun. Society & Culture: Get to know about the origin of Greek language, about Greece, etc. Supported by audios and videos, this is a really good website to learn basic and advanced Greek. 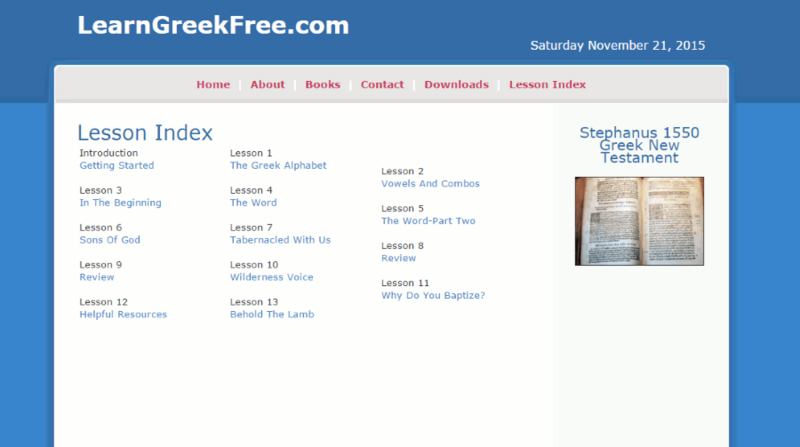 New Testament Greek is a simple website with Greek language learning material. The materials are totally based on PDF. There are 42 different lessons, all capable to teach you very good Greek. 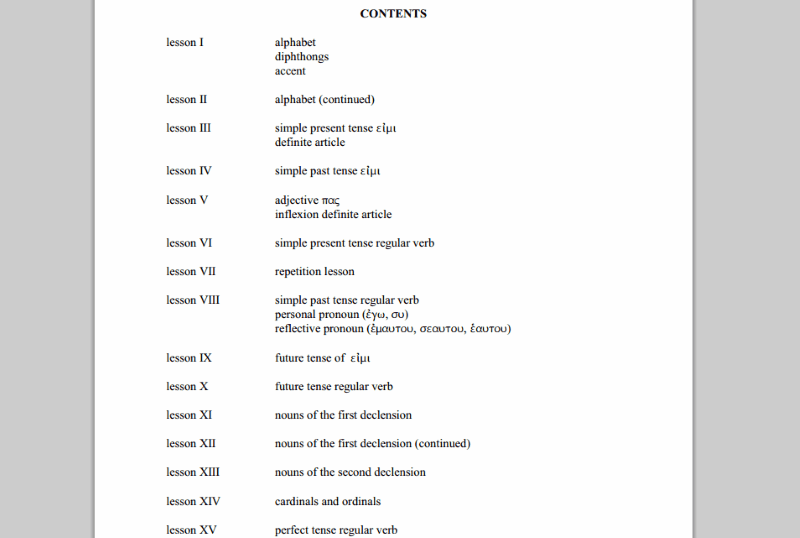 Begin from the lesson 1 to learn Greek alphabets. Move to further lessons to learn numbers, vocabulary, grammar, and much more. Click on Content to pin point the lesson you want to learn. 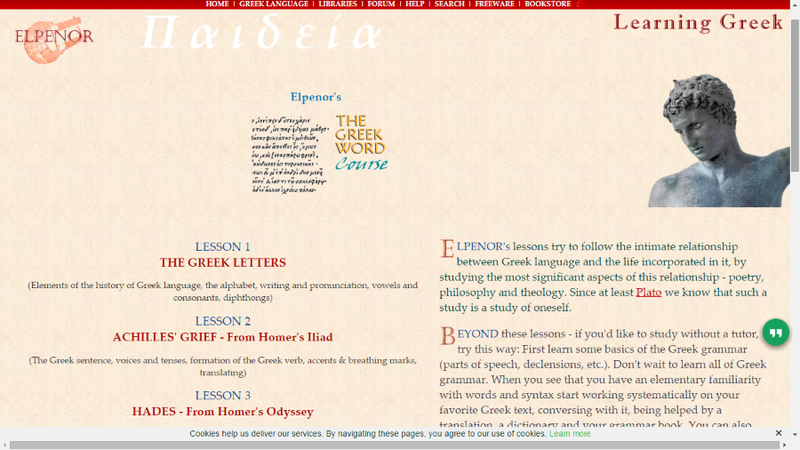 Ellopos is another good dedicated website to teach Greek. The course is basically divided into 3 lessons. 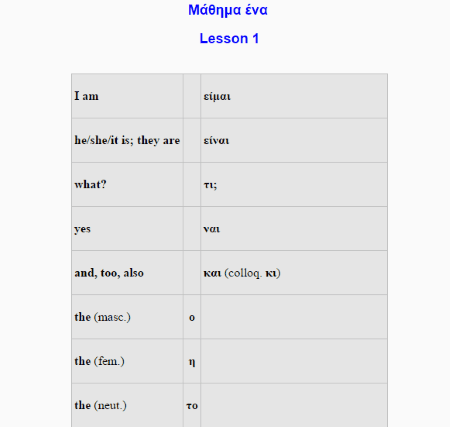 The first lesson deals with Greek letters, pronunciation, dipthongs, vowels, consonants, etc. The second lesson is about the basic Greek, which includes sentences, phrases, verbs, accents, translation, etc. The third and the last lesson is very vast. You will learn advanced grammar along with Greek vocabulary. Ancient Greek Online not only gives you an introduction to Ancient Greek, but also lets you learn Ancient Greek online. 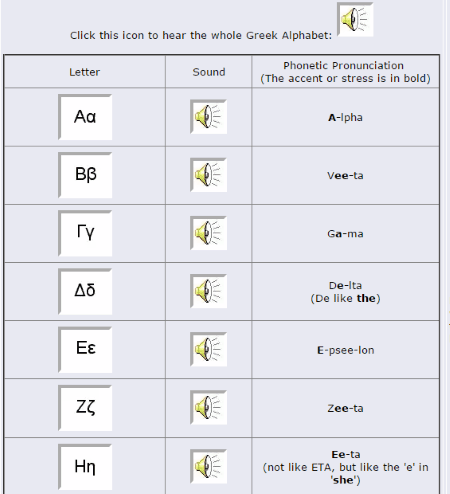 Learn Greek alphabets with pronunciations. 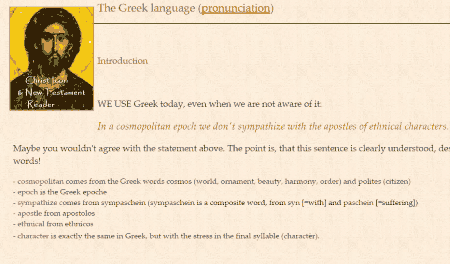 Learn about Greek grammar with the help of simple examples. A whole lesson has been dedicated to teach Ancient Greek pronunciations. There are other written materials available to teach you the importance of Ancient Greek. Learn Greek from more than 30 languages at MyLanguages. You can begin learning Greek from Greek alphabets, numbers, colors, time, food, etc. Go to the advanced level after completion of basics of Greek language. Learn Greek vocabulary, phrases, grammar, noun, pronoun, verb, etc. The Greek lessons are supported by audio playback. Access the Greek language learning tools, like radio, quiz, dictionary, translator, and much more. The Corfu Travel Guide takes you through a journey to teach Greek language. The course begins with a simple introduction to the Greek language. Learn Greek numbers, alphabets, and useful phrases in the consecutive lessons. Also learn about the weather, and food & travel in Greek. All of the lessons are neatly explained, with audio playback. Learn Greek for free on this multi language learning website 101languages. The content to learn Greek here is very helpful. Learn Greek vocabulary, phrases, and sentence formation. You will find various audio language tutorials here. Language learning tools, like quiz, games, keyboard, translator, etc are available to sharpen your knowledge in Greek language.